Modi became Prime Minister in May 2014. During his 18 months in office, he has earned the displeasure of many segments of the society. Here are ten reasons why he is disliked. 1. Modi is a ‘usurper of power’. He is trying to replicate the reign of the Slave Dynasty of the thirteenth century by seizing Delhi Sultanate, an inheritance of the Gandhi-Nehru dynasty. How dare a petty tea-vendor have the audacity to gatecrash into the hallowed portals of Lutyens’ Delhi?Howsoever ill-equipped, inept and unqualified the dynasty may be, Delhi throne is its family heritage. In any case, no competence is required to plunder India. As in the past, the country can be easily ruled through a network of sycophants, stooges and dummies. It is just a question of fine-tuning the remote controls. 2. Modi is a ‘sadist’. How dare he discard the long practiced tenet of ‘khao aur khane do’? His mantra of ‘naa khaunga, naa khane dunga’ is symptomatic of his aversion for the well-being of the ruling elite. It smacks of jealousy for the privileged. Remember how smoothly the previous coalitions functioned. Different ministries were dished out to the partners as fiefdoms. It was left to their ingenuity to garner funds. No one interfered in Raja’s spectrum loot or in Praful Patel’s aircraft purchases. Modi must not forget that leaders and bureaucrats have families. They have to amass enough to secure the future of their progeny. 3. Modi is a ‘workaholic’. Worse, he expects others to work equally hard. Introduction of biometric system to mark presence in government offices has been terribly painful. Earlier employees could walk in leisurely at any time and leave whenever they felt homesick. Many did private side-business during office hours. Movement of files was never monitored. Offices were meant for rest and recreation. Long gossip sessions with colleagues in the canteen were intellectually stimulating. Group cohesion was developed during long hours spent under winter sun in the office lawns and sharing pea-nuts. All the charm of government service has disappeared. One is expected to work now. Even senior bureaucrats have been deprived of their life-style of yore – golf in the morning, relaxed hours in the office and evenings in the Gymkhana. Modi has ruined happiness of all government employees. 4. Modi is ‘anti-media’. Eighteen months in power and not a single scandal or scam. Just not done. Media cannot be starved. Editors have no issues to embellish their headlines with. TV anchors have no hot topics for conducting high-decibel debates. They have to convert innocuous statements by some fringe elements into national controversies. No wonder media is unhappy with the present dispensation and is nostalgic about those good old days of scam-a-day. It did not have to look for topics for breaking news and evening debates. Media’s discomfort can be gauged from the fact that it has to stoop down to faulting Modi for not issuing statement on every single occurrence in the country. By depriving media of sensationalism, Modi is deliberately asphyxiating it. 5. Modi is ‘anti-employment’. All his promises of generating jobs through economic growth are phony. In fact, he has been busy shutting down existence business. Look what he has done to the patronage industry. It had taken India decades to evolve such a fool-proof and credible patronage regime: far more reliable than the much-hyped match-fixing in cricket. Every appointment, license and contract was available for a price. Every appointment was for sale and had its MRP: it could be governorship of a state or directorship of a government bank/company or even chairmanship of the Railway Board. One could obtain a chit from PMO office and get a coal block. Full satisfaction was granted to all applicants, bureaucrats and ministers. Most unfairly, Modi has put an end to such a thriving business, thus rendering numerous people jobless. 6. Modi is a ‘pseudo-secularist’. Although he had been demonised by the self-proclaimed secularists as a communal menace for decades, Modi remains unscathed. Most worrisomely, even negative campaigns like phoney anti-Christian allegations during Delhi elections and spiteful intolerance crusade during Bihar elections have not provoked him. He is letting all the doomsday-prophets down with his inclusive policies which are well received by all sections of the society. He has said or done nothing to favour any community. If Modi is allowed to establish his credentials as a secular leader, it will be difficult to dislodge him. That cannot be permitted. Therefore, renewed attacks through cooked-up issues must be launched to dent his image. Secularism is the sole prerogative of the opposition leaders. 7. Modi is highly ‘pretentious’. He has made a mess of India’s foreign policy. Instead of following the established diplomatic protocol, he has started establishing personal rapport with the world leaders. More shockingly, he has adopted yoga and hugs as instruments of his foreign policy. With his spontaneously warm embraces, he has befriended all world leaders. They admire him for his sincerity of purpose, clear vision and inexhaustible energy. Obama surprised all by agreeing to be the chief guest at the Republic Day Parade. Chinese Premier Li Keqiang had a selfie with Modi. Japanese Prime Minister Shinzo Abe attended prayers at Varanasi. By trying to practice diplomacy through hugs and yoga, he is deliberately trashing the very foundation of India’s foreign policy of laid-back indifference. 8. Modi is ‘intolerant’. How can a Prime Minister talk of cleanliness and toilets from the ramparts of the Red Fort? Who is Modi to deprive the public of the pleasure of defecating in an open and green environment? Height of intolerance to old Indian practices. If India could live with filth for so long, who is Modi to question? It is rightly said that ‘filth is in the eyes of the beholder’ and the dynasty never saw any. Similarly, it is for the parents to decide the future of their daughters. Why is Modi forcing them to educate girls? Intolerance once again. 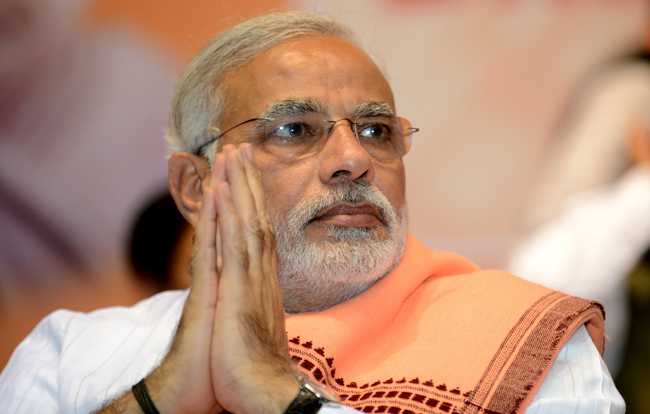 Modi has been elected to govern the country and not to don the mantle of a social reformist. He should not exceed his brief. 9. Modi is ‘misusing his oratory skills’. Not only has he been able to inspire the Indian Diaspora, but has also infused euphoric enthusiasm in India’s psyche. Pessimism and negativity have been replaced by optimism and positivity. He is deliberately resorting to erudite talks in Hindi and English to show Pappu and other caste leaders in poor light. It is most unsportsmanlike. While Modi impresses the people with his vision of a developed and prosperous India; Pappu can only talk of ‘suit-boot sarkar’ or target RSS. Worse, in comparison to Modi, Pappu looks like a cry-baby who had been deprived of his favourite toy. Modi must stop displaying wisdom and vision. He is giving an inferiority complex to the opposition leaders. 10. Modi is an ‘economic maverick’. Through his missionary zeal for economic growth, Modi has been upsetting many who were benefitting from India’s poverty. Modi’s success in attracting investment in the infra-structure and industrial growth through ‘Make in India’ campaign will improve the lot of the impoverished. That is also the main worry of the caste-leaders. Economic betterment brings awareness. An aware voter is a discerning voter. He sees through the facade of secularism to fool the people. He does not get carried away by rhetoric of caste loyalties. He demands results. No wonder that all opposition leaders view economic reforms as a threat to their political relevance. Modi appears to be hell-bent on upsetting the applecart. Finally, a footnote of caution: Modi may not be perfect, nobody is. But he is the best bet for India. Should Modi fail to deliver or is prevented from fulfilling his promises by the anti-national elements that are stalling growth, India’s future will be bleak. We will have Pappu, Mulayam Singh, Lalu Yadav or Kejriwal at the helm of affairs. Does it not send shivers down our spine?